US industrial designer born in Nevada, OH, he was raised on farms in Nebraska and Pennsylvania. With little formal education after high school, Doner worked as a youth installing radios and working on oil wells in Oklahoma. 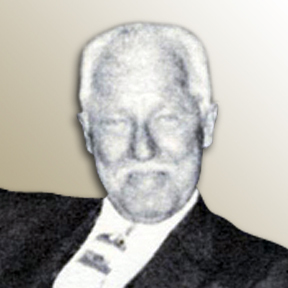 He returned to Ohio in 1932 to open a design office in Akron, working for Goodrich Rubber Company. In 1937, Doner was invited to Toledo by Libbey-Owens-Ford (L-O-F) Glass Company, and directed the Department of Design there from 1938 to 1967 in architectural and interior design applications, and promotional campaigns for color and lighting effects. He supervised the design of their warehouses, showrooms, offices, and retail stores, as well as the design of a new corporate image for truck fleets, building signs, business forms, and advertising materials. Doner's best known project was the (L-O-F) 1942 Kitchen of Tomorrow, displayed across North America, and featured in national media. During World War II he conceived the "Daylight Color System" to improve working conditions for war production in L-O-F plants. Doner was flamboyant in appearance and behavior, designing an English Sport Jacket in 1929 in Oklahoma, and had it tailored to his own specifications. In 1954, he was selected as one of the 25 men in the US to become a charter member of the American Society of Beau Brummels. He also created and staged fashion shows, always impeccably dressed in smart jacket and ascot. He was a founding member of the International Design Conference in Aspen in 1951, Chairing the Public Relations Committee 1954–1955, and serving as a member of the National Executive Committee 1954–1956. Doner was active in the Industrial Designers Institute (IDI) from 1954, serving as its national treasurer in 1945-1946, national secretary in 1958–1959, as president in 1959-1960, and as national Public Relations Committee Chair in 1961. He was awarded Fellowship in 1959, which was honored as IDSA Fellowship in 1966 after IDI became part of that organization. Doner was also active in the Illuminating Engineering Society from 1953, serving in a number of committees through 1969, and in the Design Directors in Industry, becoming a Fellow in 1953 and national secretary 1959-1960. A man of many talents, Doner converted his simple pre-fabricated home into an exotic oriental pavilion, doing all remodeling with his own hands. The home was featured in House Beautiful magazine in June 1961. Doner was a member of the Advisory Board of the Caribbean Display and Design center, San Juan, Puerto Rico in 1960-1961, and chaired the Advisory Board of the Showcase National Corporation for the United States and Canada in 1962-1967. He was a consultant to the architects and designers of Expo '67, the designers of HemisFair '68 in San Antonio, the designers of Tomorrowland for Disneyland in California, and the New York World's Fairs in 1939 and 1964. He also served as consultant to designers for the Bay Area Rapid Transit (BART). Upon his retirement in 1968, he opened a consulting office in Toledo. From 1970 he was a member of the Toledo Society of Communicating Arts.